A textured first wash can create great interest in a painting and provide a cohesive color palette. My time-lapse video shows the creation of what I call a "netting" background which, in this case, begins to form the crevices in a cliff. the brush, I sprayed the paint with water to reduce the intensity and to help it run across the paper. At the end I splattered more paint to create some darker splotches on the cliffs. Since the paper was quite wet, many of the splotches seemed to melt into the background, which was fine at this very early stage of the painting. There are plenty of opportunities to add more drips and drops of paint to the surface creating pock-holes and crevices in the rocks. Here is an image of the first wash after it was fully dry. You can see it is quite pale, but does develop a varied background upon which to work the cliff wall. 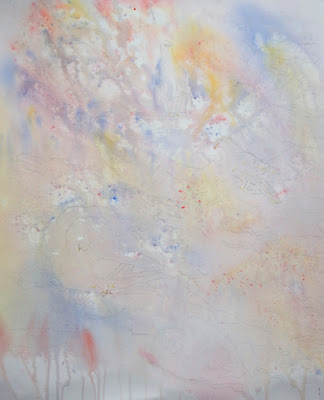 In other paintings, where I want a more distinctive background, I use stronger pigment to water mixtures so the netting effect is much more pronounced and still quite obvious in the final painting. You can see an example of that in my painting, Race. Rimpo 2017 All Rights Reserved. You may share my work with attribution and a link to this source site, but all other uses are prohibited. Available to purchase on April's website. The standard gallery commission will be provided to HorseSpirit Arts Gallery owners are they work to recover their business following the May 28, 2018 Ellicott City Flood. Recently included in April's solo exhibit "Contemporary Landscapes" at Columbia Art Center you can now find this painting at HorseSpirt Arts Gallery in Historic Ellicott City, Maryland. 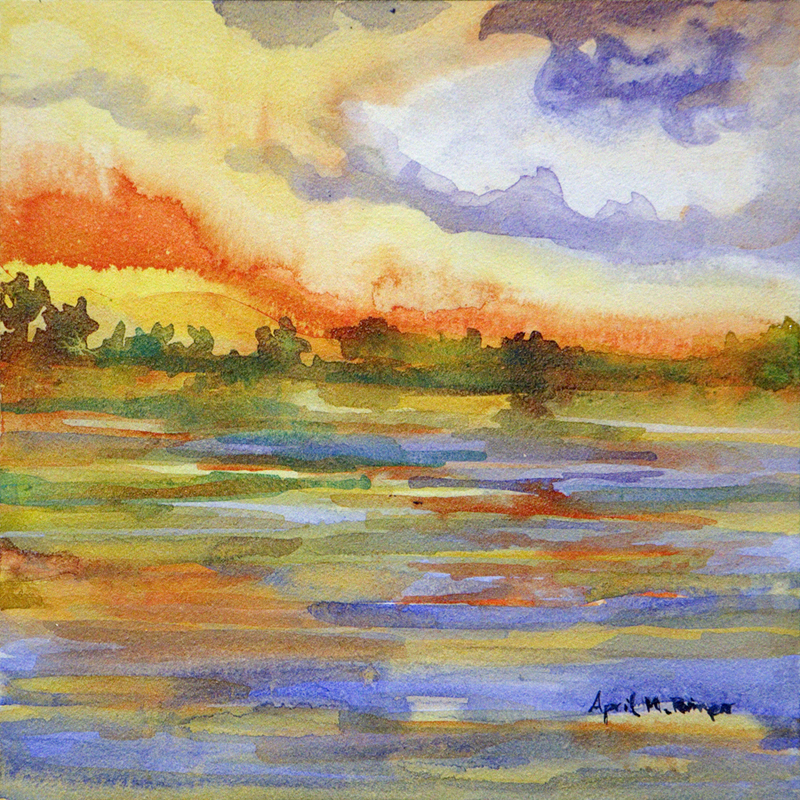 You might have noticed that Summer Breezes was done in watercolor and fluid acrylic. It started in watercolor only and matured quickly. The result looked too washed out for my liking and sat in my studio for months. Recently, I pulled it out of a stack of unfinished paintings and decided to work on it some more. I decided that the first thing I would try was adding a very dilute layer of acrylic over the sky and water. I wanted to see whether bumping up the color intensity of the painting would speak to me. Well it worked. 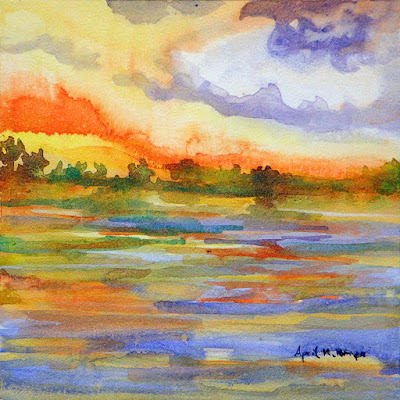 A combination of Cerulean blue and a cobalt violet blend I had been using for another painting made things start happening, so I immediately added some Cadmium Orange (hue) in the water reflections to make those more intense as well. Those changes were enough so I printed out a new copy of my photo reference and went to work adding in details and intensifying the value contrast throughout the painting. 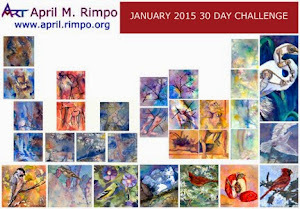 There is nothing like a change in value to add dimension to a painting. I also pushed the color in a few areas to add life and to provide more color balance throughout the piece. It is surprising how sometimes it only takes a couple hours to really turn around a painting. 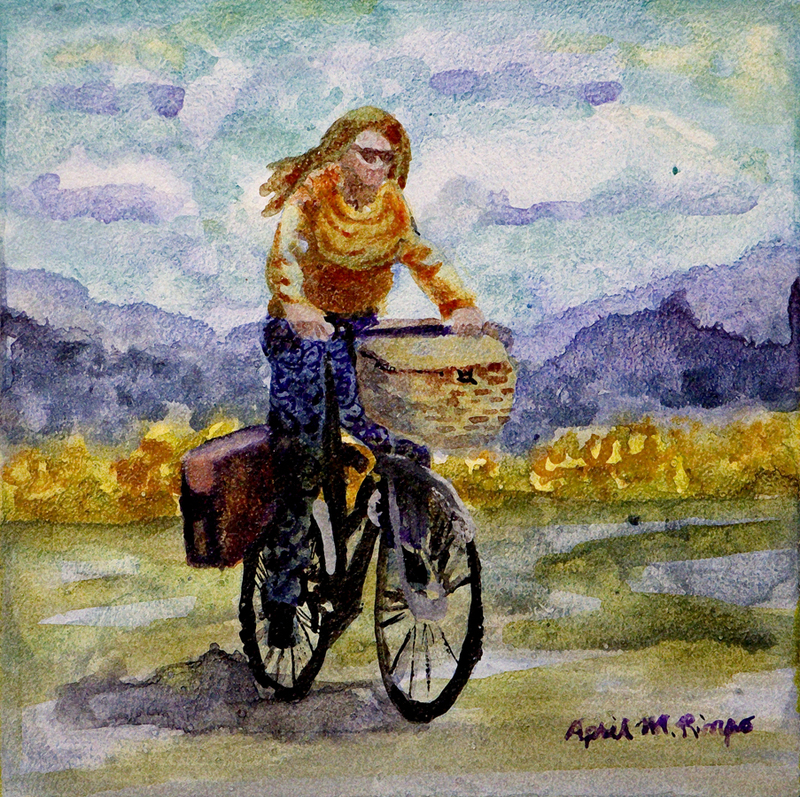 Working on Aquabord™ requires a few different techniques compared to working on canvas or watercolor paper. One of the primary differences is the tendency of Aquabord™ to bubble when first applying paint. By applying water to the Aquabord™ before you apply paint and letting it sit for about 4 minutes, most, but not all, of the bubbles dissipate. By letting the first layer dry and then adding additional layers of acrylic you can cover the bubbles, if you don't want that texture in your painting. I've found it can be a bit easier when using fluid acrylic, as compared to watercolor. When using watercolor you have to be very careful NOT to lift earlier layers of paint when applying another layer. This doesn't happen with fluid acrylic, because once dry, acrylic paint doesn't move or lift. You could scratch off the acrylic, but it would cause some damage to the surface and probably look like a flaw. If you need to recover some white when using fluid acrylic on Aquabord™, use white paint. Do you have experience working with Aquabord™ and have any tips on things you found work well with this painting platform? Contact April if you are interested in purchasing this painting. 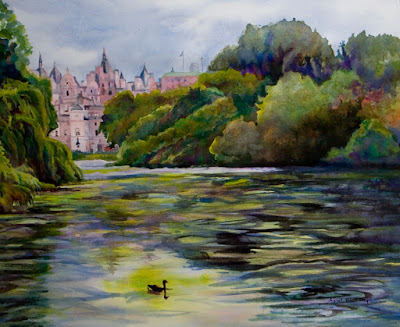 This painting was inspired by my photograph of a lake in Buckingham Palace Gardens. I was drawn by the elegance and serenity of the setting, but since I chose a color scheme that was much more vibrant the mood of the painting is quite different from my original inspiration. The black swan became the heart of this painting, standing out against the bright landscape. My use of bright colors and the intentional focus on the swan shifted the title from one about serenity to Out for a Cruise. I generally work on cold press paper, which has some texture to the surface, but since I wanted hard edged ripples of the water, I selected hot press paper. It has a very smooth surface, which also makes it quite different to work on compared to cold press. It takes a few layers of paint before I begin to be at ease with hot press paper, but in the end it was the right choice. * The painting wraps around the edge so no framing is required. It seems like unconsciously I work in series without really planning to do so. In looking back at my work I find ships, sailboats, water scenes keep popping up. The latest The Beach is shown at right. This painting received a Second Place award. In this painting the sailboat is secondary to the people musseling on the beach, yet the pathways in the sand and water do bring you back around to the lovely sailboat making me want to sail away. Sailboats are the central focus in several of my paintings over the years. 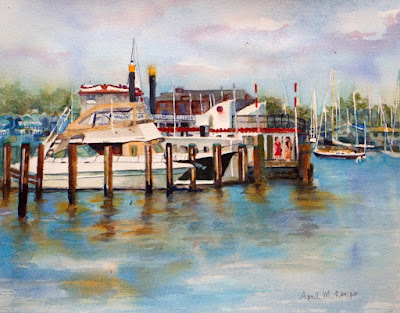 Race on the Cove was sold from a solo exhibit at the Dorchester Art Center in Cambridge, Maryland back in 2002. Even oils that predated my switch to watercolor in 1997 depicted people on the beach, as shown in Kennebunkport below. So what draws me to beach and water scenes? I think it is the serenity I find by the ocean. This struck me most dramatically when I visited the Pacific coast in Oregon as a college student. Unlike the beaches I experienced on the Atlantic coast as a child, there are very few people; there is nothing but the sound of crashing waves and maybe the frolic of an otter. The power of nature is very real and poignant; when there I feel totally at peace. I can sit on the cliffs by myself and just stare for hours. There are no troubles of the world, there is nothing that I feel I have to do except sit and enjoy. Clearly in Race on the Cove there is a lot of activity on the water, but as I remember that day there was no throng of people crowding a beach and distracting me from the race. Again, quiet was the predominant sensation. Of course, the color of the sails add that splash that I love, so this became another one of those precious moments I cherish. I have a few quotations at the bottom of my blog. One is by John Burk that perfectly characterizes how I feel about many of my paintings. "Time spent in a painting is very much like going there again on vacation. And when the painting is done, I have seen every detail and nuance so thoroughly, that a glance at the completed work is sufficient for a short visit." Perhaps that is why I paint so many of these types of landscapes. I know you won't revisit my experience when you look at these paintings, but I hope they do bring back to you some wonderful time you spent by the ocean or on a lake. I'd love to hear your stories. They will add a new dimension to my art that I could never enjoy otherwise. 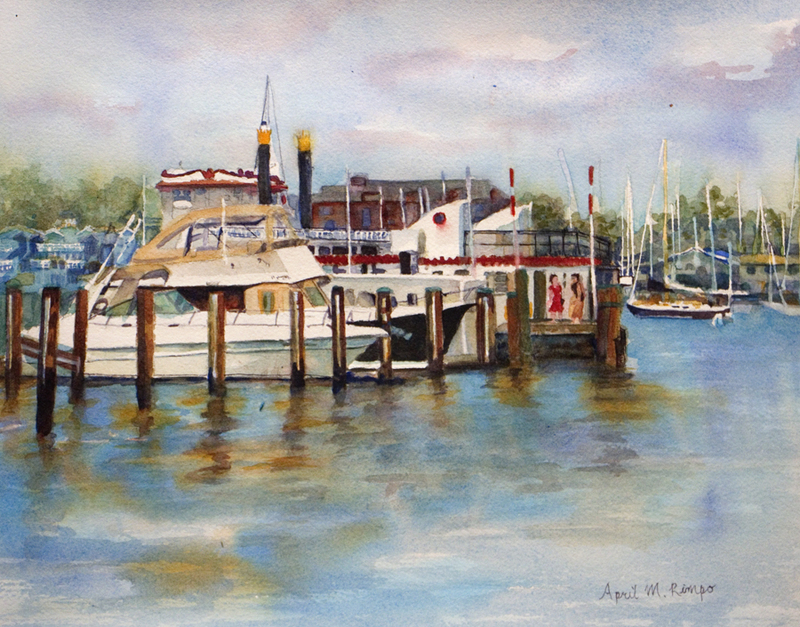 For other water and boat scenes take a look at these other blog posts. While on a walking tour in Bruges, Denmark we pasted a small lake in the center of the old medieval town. On the opposite shore was this beautiful little castle. What a perfect spot. It looked like a place where you could sit for hours taking in the wonderful scenes of this town. Bruges Towers will be included in my solo exhibit, titled Common Threads, at Touchstone Gallery from March 3rd - April 2nd. Common Threads explores cultural similarities and difference at a variety of places around the world.